Oh No!! It’s Mr. Bill! What a Saturday Night Live classic character! We went to a Saturday Night Live themed party, and this is what I came up to be. I thought he would be perfect to be and an icon for many. I started by somehow finding the perfect blue pants, white shoes white belt, and red turtle neck at the thrift store! This was meant to be for sure. 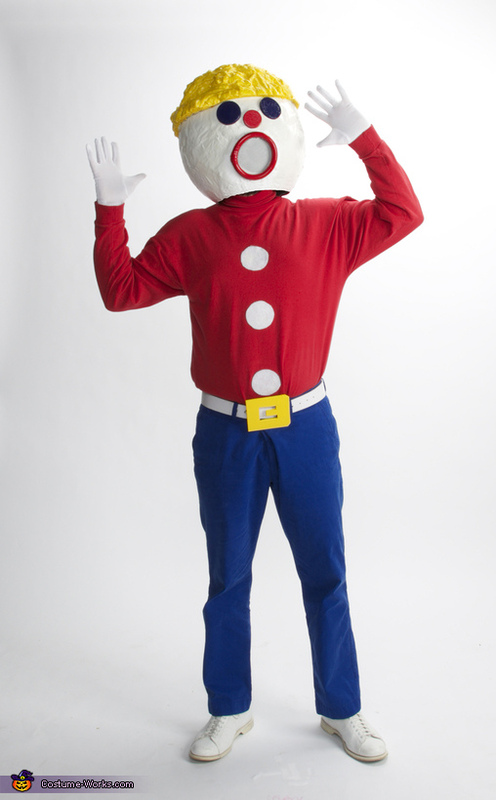 Mr Bill’s head was made from paper maché over a giant round balloon. 3 layers of paper maché then painted white with acylic paint. The eyes are 2 lids painted blue, and his nose is a lid painted red. His mouth was cut out of the head and covered with door screen hot glued to the inside, then painted white to match the head. The red ring around his mouth is rubber hose and I wired it together, then covered in electrical tape at the seam. I spray pained the hose red and gorilla glued to the head covering up the edge of the screen. The yellow belt buckle was a piece of a plastic yard sign spray painted. I attached to the belt with a good amount of Velcro®. Overall was a big hit and a lot of fun to make. Cost was cheap too since most was from the thrift store. All for around $20. Oh No!! It’s Mr. Hand! How did you do they hair on the paper mache head? Great costume! That actually is just spray foam insulation then painted it yellow. It works great for all kinds of costume stuff since you can sculpt it.. thanks for liking. Great costume! How did you keep the head centered on your own head? Did you wear a hat or something?